El Dorado Casitas by Karisma Resorts wins Trip Advisor Award as one of the Top 10 Relaxation/Spa Hotels in the Caribbean & Mexico! El Dorado Casitas Royale is dedicated to YOUR relaxation and pampering. Not only does the Casitas Spa cater to your personalized needs, its all around attention to detail and enjoyment of each and every guest is outstanding. With beach butlers tending to your needs, customizable turndown service with aromatherapy options, your very own personal concierge to create an exceptional vacation experience, and 24-hour room service, this beautiful 5-star resort is the perfect place for relaxation. We have exclusive offers available nationwide that are being featured today on TravelZoo! The deals are based out of St. Louis, but the special offers apply to other cities as well. Simply find the resort you are interested in and book online, fill out a quote request form, or contact us via phone or live chat. The folks at Karisma Resorts are at it again. They have recently renovated the AZUL Beach Hotel to the tune of $11 Million. The property is located on the beach of Bahia Petempich in Riviera Maya. This is a Gourmet Inclusive® boutique property. What is gourmet inclusive? 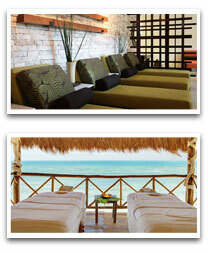 Your Gourmet vacation starts the moment you enter one of the Karisma’s all inclusive resorts in Cancun. You are greeted with a smile, a refreshing towel and a welcome cocktail. The décor and overall atmosphere of the resorts provide for a relaxed yet upscale environment with lush landscaping, beaches lined with beach beds and multiple pools with swim-up bars. You will be pampered with Gourmet services and amenities such as beach butlers, concierge, turn-down, 24-hour room service, premium beverages and Gourmet cuisine. The latter, which is the foundation for Gourmet Inclusive, has been lauded “Superb,” “Best in class,” “Decadent” and “Outstanding.” To Karisma Resorts, it simply means creating delicious meals in pleasant environments by their star chefs. Our Blog has a new look! We have decided to revamp our blog presence on the web! If you find our blog informative, please subscribe to our RSS Feed.